File The southbound portion of Interstate 11 near Railroad Pass, seen here in May, is expected to open by mid-August. A portion of the new Interstate 11 is expected to open by Aug. 15 as contractors will have to reroute traffic to complete the project. Nevada Department of Transportation officials previously had estimated the segment would be opened by the end of July. “NDOT’s contractor experienced some heavy rain and construction adjustments this summer that moved the traffic switch into August,” said Tony Illia, spokesman for the Nevada Department of Transportation. The southbound lanes of Phase 1 are scheduled to become operational as current travel lanes are closed, Illia said. Nevada Department of Transportation is building the first phase of the bypass. 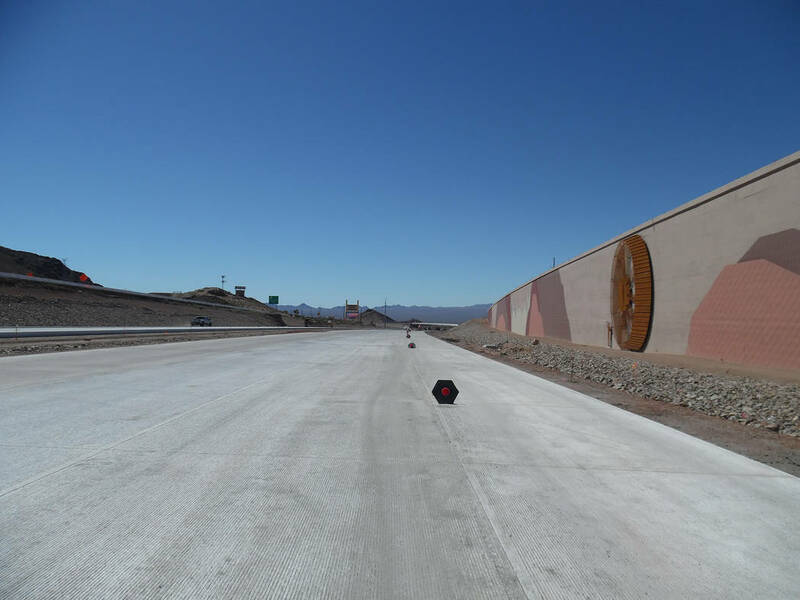 The change involves the lanes near Railroad Pass casino and will take traffic heading into Boulder City from the Henderson area on the new flyover that connects with U.S. Highway 93/95. Those heading south who want to access the casino will have to turn around at the interchange where U.S. 93 and U.S. 95 split. The search for a 42-year-old Las Vegas man who went missing Sunday while swimming at Lake Mead continues. Two men were swimming from a boat about 10:45 a.m. near Hoover Dam when they began to struggle. According to a park spokesperson, volunteers on a National Park Service boat in the area observed the men struggling to swim to shore. The volunteers were able to rescue one of the men, but the other man went underwater before he could be reached. The National Park Service has requested the support of Earth Resource Group. The company’s specialized underwater remotely operated vehicle is capable of searching in deep waters. Water depths in the area exceed 400 feet. The road to Willow Beach at Lake Mead National Recreation Area has reopened. The road was closed July 25 after it was washed out when the area received 4.72 inches of rain in a 24-hour period. Also now open are one side of the launch ramp and the takeout, and all Black Canyon River Adventure raft tours and permitted paddlecraft tours have resumed normal operations. There was severe runoff and damage along the entire length of Willow Beach Road. National Park Service crews made repairs and cleared debris from the roadway and are continuing to work in the area. Drivers are urged to use caution on the S curves. Posted speed limits are 35 miles per hour at the top of the canyon and 25 miles per hour toward the bottom. Visitors to the area also should watch out for severe weather. The National Weather Service has reported that additional storms are possible in the area through Sunday, Aug. 6. Acciona Energy has paid off almost all of its delinquent taxes on approximately 400 acres of city-owned land it leases in the Eldorado Valley. The company, which designated the land for Nevada Solar One, owed almost $163,000 in unpaid taxes and fees for the fiscal years 2013-2017. Currently, it has paid almost $140,000 of the taxes owed and is current with its installment payments to the county. Its next payment of $5,789.13 is due by Aug. 21. Another company, Sunflower Corp., is also in the process of paying back taxes to the county. It owes almost $22,000, and is current on its installment payments.